Hiiiiiiii errbodyyy! Today is Day 7, the last day, of Textured Polish Week! And for the finale, I have a complete collection to show you: the Julie G Frosted Gumdrops Collection. The first half of the collection is similar to the Zoya Pixie Dust polishes while the second half is similar to the O.P.I Liquid Sand. Now, I don't usually buy all of the polishes in a collection because usually I don't like one or two shades in it, but there was a good deal on the Jesse's Girl website (the company behind the Julie G polishes) and I couldn't pass it up! And reswatching these (I have bought these polishes a while back, and swatched them on my IG) I now have no regrets over buying the whole collection because I was reminded of how beautiful the shades are. I hope I did these polishes justice in my swatches! Headlining the first half, we have Hot Cinnamon. 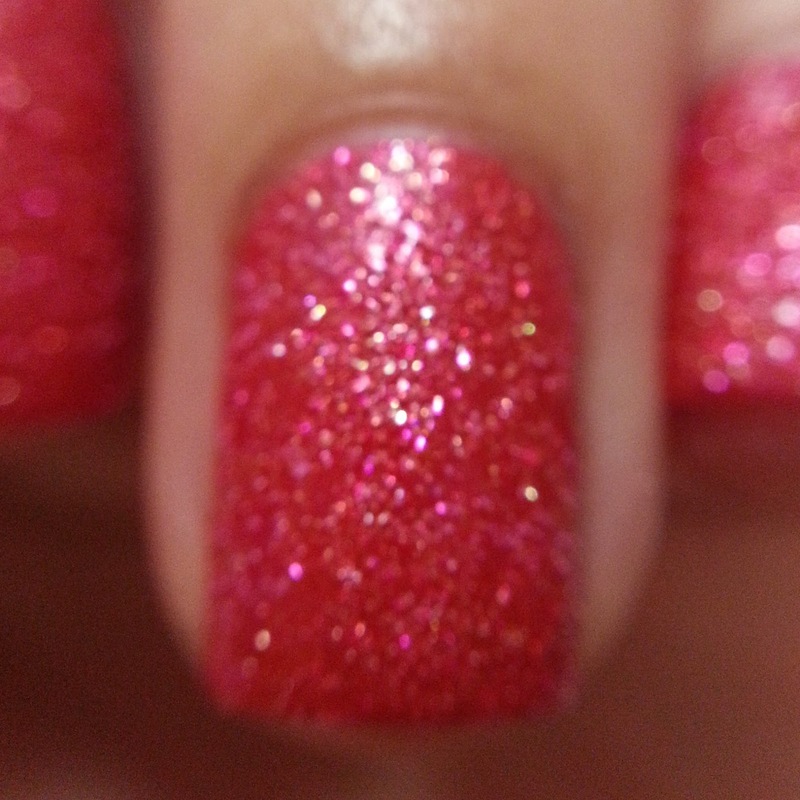 Hot Cinnamon is a red textured polish with tons of gold fleck shimmer and pink sparkles. It pains me to no end that I cannot capture the gold shimmer and the pink sparkle because it truly is gorgeous on the nail! What you see on the bottle is what you get on your nail, and more. The only way I can capture the shimmer and sparkle is to take an unfocused shot. It's actually okay with one (one!) coat but looks infinitely better with two coats. The finish is similar to the Zoya Pixie Dust polishes. Next, we have Sugar Rush. Sugar Rush is an orange, like a light vermilion, textured polish with the same gold fleck shimmer and pink sparkles as Hot Cinnamon. Again, very difficult to capture! Also opaque in one coat but much better with two. Same finish as Hot Cinnamon. And here we have Tangerine Dream. 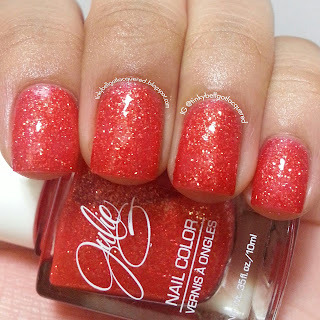 Tangerine Dream is a yellow-orange textured polish with tons of gold fleck shimmer. To my eyes it doesn't have the pink sparkle, but in my opinion it looks better without it. 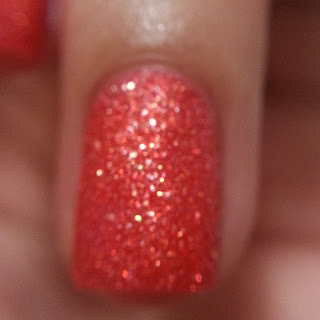 This one needs at least two coats for opacity, but would probably look best with three. Same finish as Hot Cinnamon and Sugar Rush. And now for the second half, let's start with Rock Candy. Rock Candy is a metallic light green textured polish that has slightly bigger silver glitters. It's less bluish in person, definitely green. It's completely different from the first half of this collection, but I think it works because the silver works better with the cool tones. Perfectly opaque in two coats. 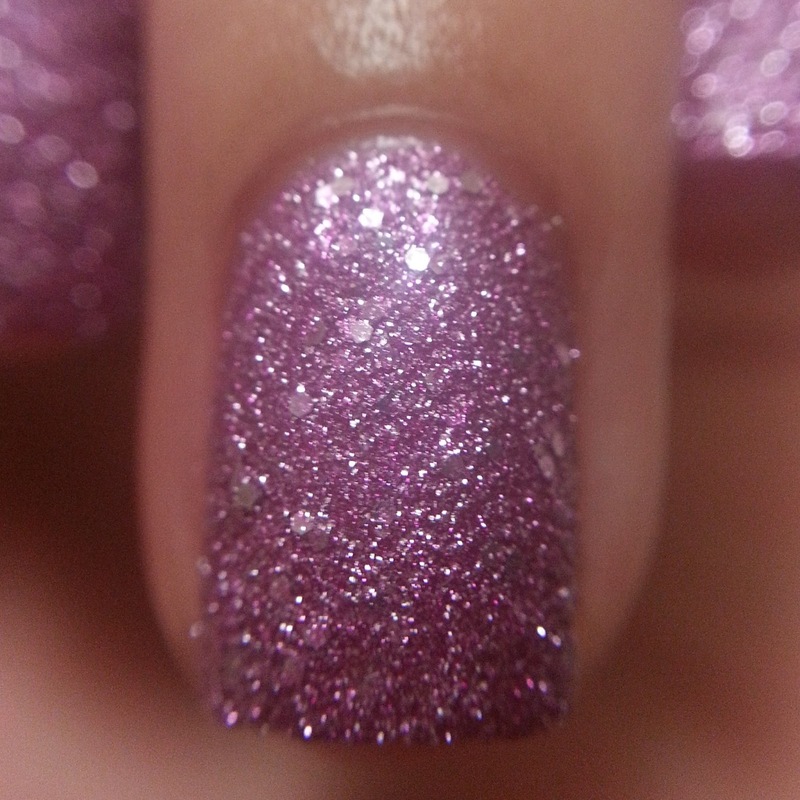 The finish is similar to the O.P.I Liquid Sand polishes with regards to the bigger glitter pieces. Next, we have Blueberry Fizz. Blueberry Fizz is a metallic light blue, sort of like a light-wash denim, textured polish with the same glitters as Rock Candy. I'm in love with this color! Also perfectly opaque in two coats. Same finish as Rock Candy. And rounding out the collection, here is Crushed Candy. Crushed Candy is a metallic red-leaning purple textured polish with the same silver glitters as Rock Candy and Blueberry Fizz. Again, perfectly opaque in two coats. Same finish as the two from this half of the collection. And of course I have to try them with top coat! Would I recommend these polishes? Yes, definitely! The colors are gorgeous, the formula is great, and the dry time is pretty fast. The price is pretty okay, at $3.99 for a 10 ml bottle. It may be a bit expensive for some, but the colors make up for it. I personally think it's a good deal. Availability might also be an issue for some, so check your local Rite-Aid, Tiffany's Family Drugstores and Fagen Pharmacy. You can always also order online at Jesse's Girl website (they have free shipping for orders over $20!) Groupon actually had the set for about $13 plus shipping back in April, but I've heard some girls had problems with bottles breaking due to improper packaging. Anyway, if you can get your hands on these polishes, you definitely should!